When it comes to the global threat landscape, the second half of 2018 revealed the equivalent of attacks on steroids, as attackers bulked up existing tactics, rapidly evolved new ones, and applied smart business techniques to vastly accelerate their growth rate. IoT devices were attacked within five minutes of being plugged into the internet. Nation-state APT group activity ratcheted up in volume and targets while existing actors continued to innovate, including the first observed use of Chrome extensions to enable persistence in the STOLEN PENCIL campaign. Finally, the use of business practices such as the affiliate model empowered crimeware such as Danabot to achieve rapid global targeting. As the scale of all types of attacks continues to increase, traditional stateful perimeter security devices like firewalls often strain to keep up. Adding stateless technology between the firewall and the Internet router, armed with advanced reputation and threat intelligence data, can decrease the heavy load on your existing perimeter defenses, protect them from state exhaustion attacks, and even provide blocking of outbound threats (like bots communicating with C&C). This webinar will explore the realm of stateless technology and the Internet edge, with best practices, lessons learned, and key deployment strategies that will prepare attendees for a future of increasing and diverse attacks. Tom has been in the network and security field for over 20 yrs. During this time, he has worked for large enterprises as a Network Engineer and for multiple network management and security vendors where he has had roles in Sales Engineering /Management, Technical Field Marketing and Product Management. Currently at NETSCOUT he’s a Director of Product Marketing focusing on their industry leading Edge Defense and Threat Intelligence solutions. Tom routinely speaks at IT security events around the world providing insights into cyber threats and best practices in defense. Cloud computing has become the de-facto hosting platform for all types of applications, social innovations and use cases such as Big Data, the Internet of Things, smart mobility and social networking – basically it is the new normal. This is true everywhere including all industry sectors and companies in all sizes. Bringing new technology into the market always comes with many challenges. This is no different for cloud computing, even though its adoption in the market has been very fast. I usually bucket cloud adoption challenges in three categories, namely: migration, Total Cost of Ownership (TCO) and Data handling. According to surveys by Netscout and RightScale published in 2018, a cloud users leverage on average around 5 clouds; hybrid and multi-clouds are likely the future; security, managing cost and lack of skilled resources rank on the top challenges; & as expected there are still migration challenges. In this talk, I will provide my views on the state of cloud computing in the enterprise, talk about the challenges and talk about the typical role of the CIO to deal with digital transformation challenges. -Cloud challenges in the Enterprises vary based on the size of the enterprise and where they are in the cloud adoption journey. When this happens, getting to root-cause quickly and allowing for effective troubleshooting and minimal downtime is key to the business and end-user experience. You need full traffic flow visibility for your service assurance and cyber security tools to perform effectively. This means that they should only process the traffic they are designed to see. Otherwise, they waste precious resources filtering or load balancing packets before the security logic can be applied. • Why organizations are turning to packet aggregators help control their costs of network security and monitoring tools. • What packet aggregators do and how they function. • What you should consider when selecting the right packet aggregator for your environment? Please join NETSCOUT Technology experts, Mark Doering and Eric Gray for this webinar focused on demystifying the market offerings around packet aggregation. AirCheck G2 has new enhancements that will allow wireless professionals to get over the air firmware updates and upload more test results to the complimentary Link-Live Cloud Service. Over-the-network profile sharing will also now be available. Additionally, there has been enhanced AP name support and improved packet captures! Attend this webinar with CWNP Julio Petrovitch, the AirCheck G2 product manager to learn more. * Real-life examples of how companies around the world are monitoring critical network and apps, no matter where they are accessed. * Why it is critical to monitor your network even when no one is using the system. * How to monitor from locations that do not have IT support on site. •Are there standardized best practices to help deployment? The overall benefit of PoE is to facilitate the ease of deployment of network connected devices. When deploying a PoE system the power delivery, types and classes, and power managements must be considered. This webinar will arm you with the knowledge to deploy PoE enabled devices in the most effective way possible. Dr. Vikram Saksena, Sr. Director, SBO, NETSCOUT discusses how carriers and enterprises can gain a single source of truth for both application performance and security management in complex, multi-vendor environments. Elections systems are like banks, in that our faith in their security matters almost as much as the actual security itself. As we are beginning to learn, if you undermine that faith, you can do a lot of damage. One only needs to turn on cable news for a few minutes to realize that our nation’s adversaries have proven they can attack our elections and be effective. Assuring UC&C service quality as you bring together multiple vendors and platforms into your complex, hybrid infrastructure is an everyday challenge. Getting to root-cause quickly so you can reduce MTTR is a requirement. Learn from our NETSCOUT Engineers, Rene Alvarado and Leon Li, both who bring over 20 years of experience working with the Fortune 100, deploying UC &C and solving the most critical business application performance problems. • How you can optimize your Unified Communication & Collaboration Services with best practices to help save money and time, avoid headaches, and protect the quality of your UC&C environment. With dynamic service and network configuration taking place within a complex operating environment, service assurance platforms will need to optimize intelligence to identify if a fault is at the virtual network function (VNF), physical network function (PNF), or cloud infrastructure to assure the reliability and quality of services in a hybrid network environment. End-to-end service management is crucial as Carrier Service Providers (CSP) aspire to the real networking end game: closed-loop automation. Our presenters will discuss the complexities and challenges for CSPs, as they transition from traditional platforms to deploying and managing the new software-based platforms and applications, required for service agility in a hybrid networking environment. Making the decision to evolve to the agile NSX SDDC environment as part of your Digital Transformation initiative brings its own challenges of security design and application deployment; and is not without risk. This means that maintaining visibility to assure your business service into this new virtual, secure world is critical to migration success. Join Ray Krug, Enterprise Solutions Architect as he discusses how you can leverage NETSCOUT, a VMware Ready Certified Partner in Networking and Security for SDDC space, and your existing nGenusONE Service Assurance platform to extend continuous visibility of your micro-segmented environment, to assure the successful deployment and ongoing security and performance of services in your NSX environment. 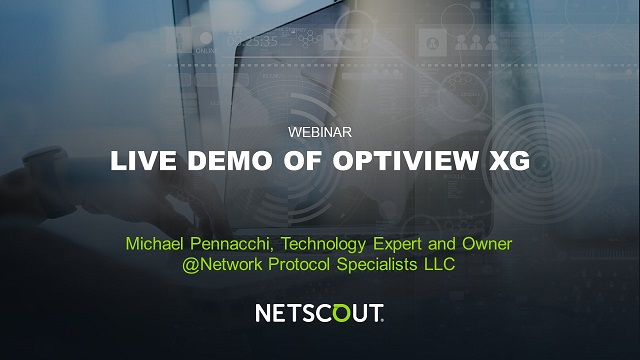 •How NETSCOUT can extend the visibility you already depend on with deployment in an NSX environment. •Demonstrate how NETSCOUT provides visibility for SDDC in NSX and beyond into the public cloud. • Real-life examples of how businesses have harnessed this visibility in their Cloud environments. NETSCOUT is a market leader in real-time service assurance and cybersecurity solutions for today’s most demanding service provider, enterprise and government networks. NETSCOUT’s Adaptive Service Intelligence (ASI) technology continuously monitors the service delivery environment to identify performance issues and provides insight into network-based security threats, helping teams to quickly resolve issues that can cause business disruptions or impact user experience. NETSCOUT delivers unmatched service visibility and protects the digital infrastructure that supports our connected world. To learn more, visit www.netscout.com.